Trajan became emperor this day in 98 AD. In this year's Chinese Taoist calendar, this is the last day of the old lunar year of 2004 - 2005. It is called The Day for all Gods to descend to Earth -- and thus to be present and in union with humankind for the beginning of the New Year on Jan. 21. On the day before New Year, the Chinese prepare the feast for the next day. A new picture of the Kitchen God is put up. Feasts are set out for the household gods, then the ancestors on "The Table of Heaven and Earth," a long table is set up in the courtyard. A yellow paper with representations of all the heavenly sages and deities is set on it and in front of this people set out "honey offerings:" apples, dried fruits, breads, vegetables and New Year cakes. Hanging above the table are figures of the Eight Immortals threaded together with vines decorated with paper pomegranate flowers. On New Year's Eve, people dress up and visit relatives and friends "bidding farewell to the old year." Newly married men are expected to go the house of their wife's parents; not doing so will bring bad luck. Everyone stays up, sipping on wine and nibbling on refreshments, to see out the old year. Candles are lit and women and children play cards and throw dice. Fireworks explode, especially during the double-hours (last of the old year and first of the new). In the Buddhist calendars of many East Asian countries, this last day of the old year is observed as Sojong Day, when rites of fasting and self-purification, of asking and giving forgiveness are played to clean old uneasy energies from the soul and prepare for the New Year. 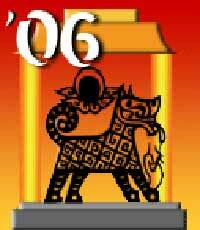 The year of the Fire Dog is the image of fire burning across or above the earth. As such, according to the cycle of the five elements, this combination forms a harmony which makes the earth strong. However, whenever the Earth becomes strong it tends to become excessive or overbalanced. So in a year when it becomes strong, it will have to expend energy to restore balance. For instance, there could be bush fires or other big fires, earthquakes, landslides, volcanic eruptions, explosions (due to earth-disturbing fossil fuels), other unforeseen influences that cause destruction via fire, heat or collapse of the earth's surface. The last Fire Dog Year was in 1946 and there was much evidence to support this. There were tsunamis in Hawaii, the beginning of nuclear testing in the Pacific Ocean, and the French Indochina war. That year also brought about the birth of the first digital computer: the ENIAC. The Fire Dog year will emphasise the illumination of knowledge, humanitarian issues and significant earth changes. Historically, this configuration has carried the connotation of 'fire building to strengthen the earth', but the stronger the earth gets the more it has the capacity to become a 'tomb' for the fire, The potential to apply the results of knowledge for humanity is hampered. It is said that when the Buddha was examining the 11th animal, the Dog, he acknowledged the Dog as a true server of mankind. The Buddha loved the Dog because of its loyalty, faithfulness and hard working nature, with qualities of love, bravery and unshakeable devotion.